Scientists and mental health professionals may adopt different perspectives in attempting to understand or explain the underlying mechanisms that contribute to the development of a psychological disorder. The perspective used in explaining a psychological disorder is extremely important, in that it will consist of explicit assumptions regarding how best to study the disorder, its etiology, and what kinds of therapies or treatments are most beneficial. Different perspectives provide alternate ways for how to think about the nature of psychopathology. For centuries, psychological disorders were viewed from a supernatural perspective: attributed to a force beyond scientific understanding. Those afflicted were thought to be practitioners of black magic or possessed by spirits ([link]) (Maher & Maher, 1985). For example, convents throughout Europe in the 16th and 17th centuries reported hundreds of nuns falling into a state of frenzy in which the afflicted foamed at the mouth, screamed and convulsed, sexually propositioned priests, and confessed to having carnal relations with devils or Christ. Although, today, these cases would suggest serious mental illness; at the time, these events were routinely explained as possession by devilish forces (Waller, 2009a). Similarly, grievous fits by young girls are believed to have precipitated the witch panic in New England late in the 17th century (Demos, 1983). Such beliefs in supernatural causes of mental illness are still held in some societies today; for example, beliefs that supernatural forces cause mental illness are common in some cultures in modern-day Nigeria (Aghukwa, 2012). 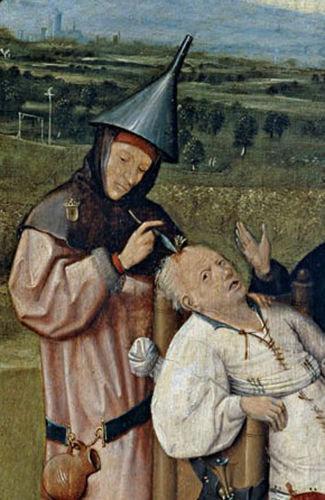 In The Extraction of the Stone of Madness, a 15th century painting by Hieronymus Bosch, a practitioner is using a tool to extract an object (the supposed “stone of madness”) from the head of an afflicted person. Between the 11th and 17th centuries, a curious epidemic swept across Western Europe. Groups of people would suddenly begin to dance with wild abandon. This compulsion to dance—referred to as dancing mania—sometimes gripped thousands of people at a time ([link]). Historical accounts indicate that those afflicted would sometimes dance with bruised and bloody feet for days or weeks, screaming of terrible visions and begging priests and monks to save their souls (Waller, 2009b). What caused dancing mania is not known, but several explanations have been proposed, including spider venom and ergot poisoning (“Dancing Mania,” 2011). 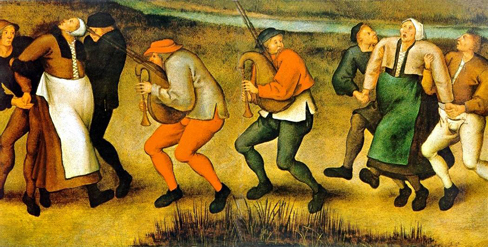 Although the cause of dancing mania, depicted in this painting, was unclear, the behavior was attributed to supernatural forces. Historian John Waller (2009a, 2009b) has provided a comprehensive and convincing explanation of dancing mania that suggests the phenomenon was attributable to a combination of three factors: psychological distress, social contagion, and belief in supernatural forces. Waller argued that various disasters of the time (such as famine, plagues, and floods) produced high levels of psychological distress that could increase the likelihood of succumbing to an involuntary trance state. Waller indicated that anthropological studies and accounts of possession rituals show that people are more likely to enter a trance state if they expect it to happen, and that entranced individuals behave in a ritualistic manner, their thoughts and behavior shaped by the spiritual beliefs of their culture. Thus, during periods of extreme physical and mental distress, all it took were a few people—believing themselves to have been afflicted with a dancing curse—to slip into a spontaneous trance and then act out the part of one who is cursed by dancing for days on end. The biological perspective views psychological disorders as linked to biological phenomena, such as genetic factors, chemical imbalances, and brain abnormalities; it has gained considerable attention and acceptance in recent decades (Wyatt & Midkiff, 2006). Evidence from many sources indicates that most psychological disorders have a genetic component; in fact, there is little dispute that some disorders are largely due to genetic factors. 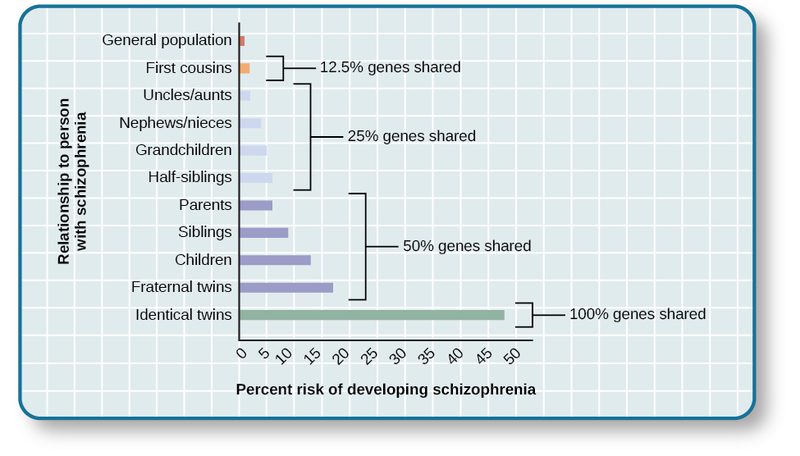 The graph in [link] shows heritability estimates for schizophrenia. A person’s risk of developing schizophrenia increases if a relative has schizophrenia. The closer the genetic relationship, the higher the risk. Findings such as these have led many of today’s researchers to search for specific genes and genetic mutations that contribute to mental disorders. Also, sophisticated neural imaging technology in recent decades has revealed how abnormalities in brain structure and function might be directly involved in many disorders, and advances in our understanding of neurotransmitters and hormones have yielded insights into their possible connections. The biological perspective is currently thriving in the study of psychological disorders. Despite advances in understanding the biological basis of psychological disorders, the psychosocial perspective is still very important. This perspective emphasizes the importance of learning, stress, faulty and self-defeating thinking patterns, and environmental factors. Perhaps the best way to think about psychological disorders, then, is to view them as originating from a combination of biological and psychological processes. Many develop not from a single cause, but from a delicate fusion between partly biological and partly psychosocial factors. The diathesis-stress model (Zuckerman, 1999) integrates biological and psychosocial factors to predict the likelihood of a disorder. This diathesis-stress model suggests that people with an underlying predisposition for a disorder (i.e., a diathesis) are more likely than others to develop a disorder when faced with adverse environmental or psychological events (i.e., stress), such as childhood maltreatment, negative life events, trauma, and so on. A diathesis is not always a biological vulnerability to an illness; some diatheses may be psychological (e.g., a tendency to think about life events in a pessimistic, self-defeating way). The key assumption of the diathesis-stress model is that both factors, diathesis and stress, are necessary in the development of a disorder. Different models explore the relationship between the two factors: the level of stress needed to produce the disorder is inversely proportional to the level of diathesis. Psychopathology is very complex, involving a plethora of etiological theories and perspectives. For centuries, psychological disorders were viewed primarily from a supernatural perspective and thought to arise from divine forces or possession from spirits. Some cultures continue to hold this supernatural belief. Today, many who study psychopathology view mental illness from a biological perspective, whereby psychological disorders are thought to result largely from faulty biological processes. Indeed, scientific advances over the last several decades have provided a better understanding of the genetic, neurological, hormonal, and biochemical bases of psychopathology. The psychological perspective, in contrast, emphasizes the importance of psychological factors (e.g., stress and thoughts) and environmental factors in the development of psychological disorders. A contemporary, promising approach is to view disorders as originating from an integration of biological and psychosocial factors. The diathesis-stress model suggests that people with an underlying diathesis, or vulnerability, for a psychological disorder are more likely than those without the diathesis to develop the disorder when faced with stressful events. The diathesis-stress model presumes that psychopathology results from ________. Dr. Anastasia believes that major depressive disorder is caused by an over-secretion of cortisol. His view on the cause of major depressive disorder reflects a ________ perspective. Why is the perspective one uses in explaining a psychological disorder important? The perspective one uses in explaining a psychological disorder consists of assumptions that will guide how to best study and understand the nature of a disorder, including its causes, and how to most effectively treat the disorder. Even today, some believe that certain occurrences have supernatural causes. Think of an event, recent or historical, for which others have provided supernatural explanation. Perspectives on Psychological Disorders by OpenStaxCollege is licensed under a Creative Commons Attribution 4.0 International License, except where otherwise noted.